Singer Adele performs on March 15, 2016 in London, England. As if you needed another reason to love Adele. The 28-year-old singer gave an impromptu performance of part of the Spice Girls' 1997 anthem "Spice Up Your Life" during a recent concert. Spice Girls singer Melanie Chisholm, aka Mel C and "Sporty Spice," retweeted a fan's video of the performance Saturday and reacted perfectly — with a string of heart eyes emojis. Emma Bunton, aka "Baby Spice," also posted the video on Twitter, as did Geri Halliwell, or Ginger Spice, who tweeted, "Go @Adele." Adele had sung the Spice Girls' 1996 debut track "Wannabe" with James Corden of "The Late Late Show" on his popular Carpool Karaoke segment earlier this year. Like many young women who grew up in the '90s, Adele idolized the pop group. "It was a huge moment in my life when they came out," she said. "It was 'Girl Power' and there were these five ordinary girls who just, like, did so well and just like, got out. So I was like, 'I want to get out. I don't know what I want to get out of, but I want to get out,' and it was a really important period of my life." She told Corden she used to have Spice Girls parties and dressed up like Halliwell. She also recalled the singer's departure from the pop group in 1998. 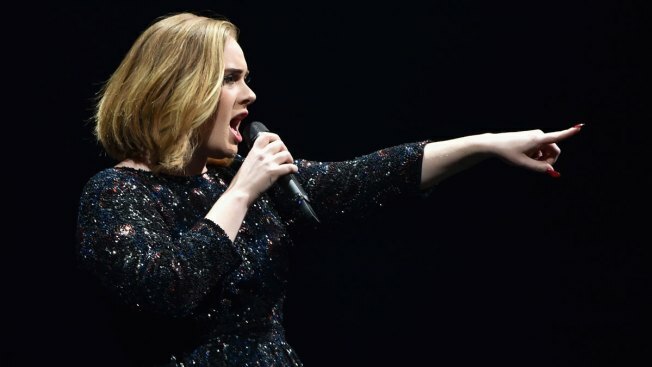 "It was the first time I was truly heartbroken," Adele said. "Is that what 'Someone Like You's about?" Corden joked. Halliwell, who rejoined the band for a reunion tour in 2007, had paid tribute to Adele after the segment aired. Victoria Beckham, or "Posh Spice," called the video "genius."